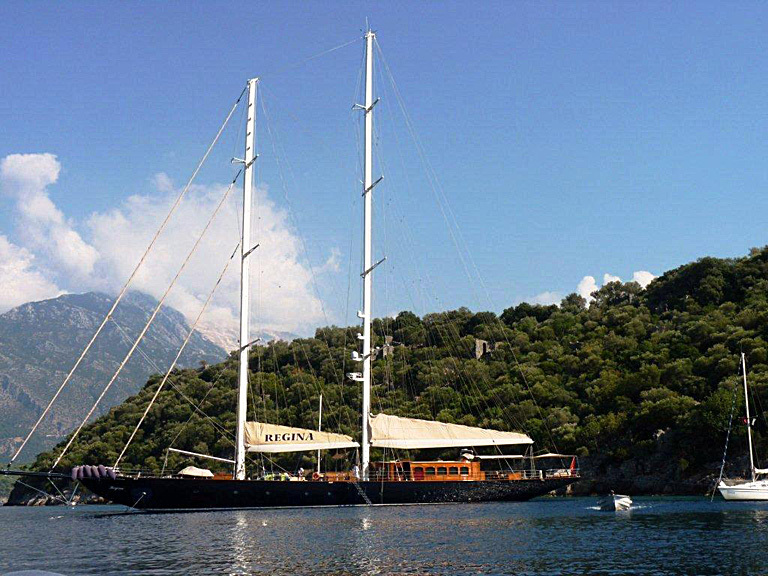 News reaches us that Daniel Craig has been seen filming scenes for the new James Bond movie “Skyfall” on board a yacht in Turkey. The 007 actor was photographed enjoying a break with his co-star Bérénice Marlohe on board the 56m schooner ‘Regina’ earlier this month. 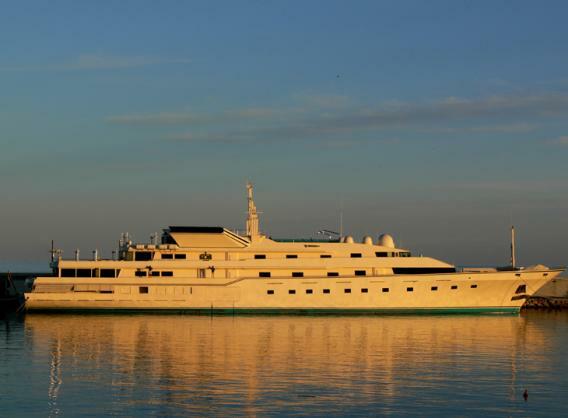 Regina was launched in February 2011 by Med Yachts and is now on sale with Fraser Yachts. This superyacht can accommodate 12 guests and 9 crew. She boasts a 12-person table that can be transformed into a sun deck during the day as well as a snow white polished grand piano amongst the latest entertainment technology. Regina also offers a range of water sports including a Jet Ski, two water skis, and two canoes, masks and pallets. Twin 440hp MAN engines power this superyacht, giving her a cruising speed of 12 knots. All for only £11 million. This elegant sailing yacht marks a change from the last four movies that heavily featured Sunseeker vessels. In The World is Not Enough, a Sunseeker Superhawk 34 speeds down London’s River Thames at over 60 mph in the longest-ever Bond pre-title sequence. In the next film, Die Another Day, Halle Berry’s curves were seen diving from a high rampart into the sea to be whisked off by a Sunseeker Superhawk 48. The two most recent films, Casino Royale and Quantum of Solace, also heavily featured Sunseekers; a Sunseeker Predator 108 is used by the baddie Le Chiffe in Casino Royale whilst in Quantum of Solace a Sunseeker Superhawk 43 is again used by the baddies in a sequence set in Haiti. Perhaps the most glamorous Sunseeker used is the vintage Sunseeker Sovereign 17 motorboat featured in Quantum of Solace. This vessel, originally built in 1970 was completely restored by the company to celebrate it’s anniversary in 2005. In the film the captain of this vessel is none other than Sunseeker International’s managing director Robert Braithwaite CBE. Fairey boats featured in the opening sequence of ‘From Russia with Love’. Sean Connery as James Bond can be seen driving a white Fairey Huntress and the being chased by a Fairey Huntman 28s and Fairey Huntress. Probably the most iconic Bond boat is the ‘Disco Volante’ from Thunderball. The original hydrofoil used was called the “Flying Fish”, built by Rodriquez Cantieri Navali. It never sailed again after the making of Thunderball. It was rented as a stationary houseboat docked at a marina in Miami until it sank at the dock in the early 1980s. Disco Volante translates as Flying Saucer which is the name of a different yacht used in the remake of Thunderball, Never Say Never Again. The yacht was built in 1980 by the Benetti for Saudi arms dealer Adnan Khashoggi and named Nabila for his daughter. It was during this period that she was featured in Never Say Never Again. In 1988 she was sold to the Sultan of Brunei, who in turn sold it to Donald Trump who renamed her ‘The Trump Princess’ and put her through a massive refit. Trump sold her to Prince Al-Waleed bin Talal who is the present owner. Al-Waleed renamed her for his investment company, Kingdom Holding Company, his lucky number (5), and his children’s initials (‘K’ and ‘R’) Kingdom 5KR. She is currently the 22nd largest private yacht in the world – she was number 1 back in 1980 when she was first launched which just goes to show the ever increasing size of vessels being launched. In Moonraker James Bond uses a 1979 Gastron Carlson CV23HT (“HT” is for hardtop). The ’78 and ’79 models sold to the general public came in either metalflake blue or metalflake bronze but special CV23HTs were produced for the movie in a silver gray metalflake. During the CV23 production run from 1976 to 1988 the hardtop model was only produced in 1978 and 1979 and only a total of 300 of which only 5 are known to still exist today. 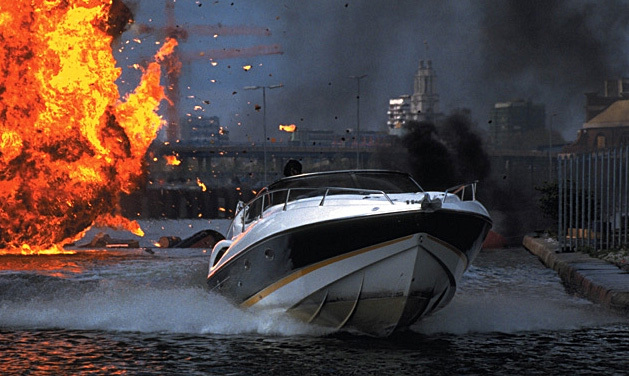 Of the Bond boats, two did not survive the movie and the last was destroyed while being transported on February 26th 2006. It was subsequently restored though even though only the hull and windscreen were all that was left. It is on display at the The Museum of Bond Vehicles & Espionage in Momence, Illinois. Personally we’d always hoped that this one would get released for sale!